If you’re undergoing a house move but don’t know how to prepare for moving day it is necessary to get everything in order as soon as possible. This will save you undue stress and hassle and will make the process run a lot smoother. Finding a well reputed removal company that you can trust will definitely help. At London Removal our wide range of services means that you won’t need to look anywhere else and our packing services means that we can supply you with everything that you need to get your move kick started, because after all, preparation is key. Our team know about the materials that you require, so whether you need a protective wrap for large bits of furniture, packing boxes or bubble wrap, foam or packing tape for your smaller boxed item, we have all the supplies for you. Get in touch with us now on 020 8746 4506 to find out more about what we can offer you, or to ask some advice from one of our friendly and knowledgeable advisors. We are glad to help, contact us today! Packaging up your possessions might seem simple and relatively easy to get on with, but if you don’t pack with the appropriate materials, you might arrive at your new destination only to discover that your precious items are damaged and broken beyond repair. We understand that certain items are priceless and that you might hold an emotional connection with some of your old possessions. This is why it is essential that you spend the time to browse through our website and purchase the necessary packing materials. If you have packaged up your items correctly, ensuring that they are properly padded, cushioned and protected, then the likelihood is that you will be unpacking your boxes and your items will be in the same condition as when you left them. As a removal company, of course we don’t plan on your removal boxes and furniture getting bashed about whilst being transported in a moving vehicle, but sometime this is out of our control. This is also another reason why you should think twice about using a self hire vehicle because in these cases, you will have to pack and move boxes into the van yourself. However if you choose to book and carry out your removal project with our company, we will do our very best to transport your moving boxes from your rooms and into our moving vehicle where we will use our expertise and years of experience to pack them appropriately into the back of the truck. Many removal vehicles also come equipped with various straps and some forms of padding of their own, to give even more protection to your belongings whilst they are being transported. Start to package your belongings a few days before you move to ensure that you have all the right packing materials. We know from experience what people require when it comes to packing, so take a look at our website for your one stop solution for all of your packaging needs. 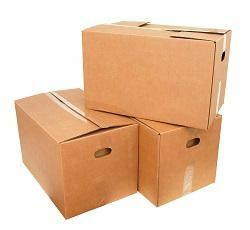 We can supply you with a variety of items, all of which would be beneficial to you, such as removal boxes; either containers or cardboard boxes and much much more. All you need to do is give us a call on 020 8746 4506 for further advice about our packing services and to purchase moving boxes and other supplies for your moving project.